need of a makeover? 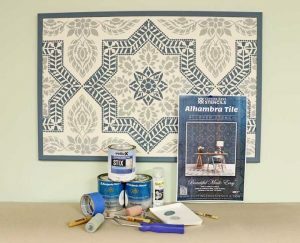 Well have no fear, because we have an easy and inexpensive stencil project that will take your boring cork board to the next level. Using a tile stencil, we upcycled this ordinary office cork board into a stenciled treasure. Let’s get stenciling!